Hummingbirds can be enchanting birds, but even the most experienced birders have difficulty knowing how to identify hummingbirds because of their small size and quick movements. With a bit of practice, however, it can be easy to identify different hummingbird species. Birders with the right equipment will be better prepared to identify tricky hummingbird species. Binoculars: A good pair of birding binoculars is invaluable for bringing these tiny birds close enough to see the details necessary for proper identification. Higher magnification is also essential for closely observing hummingbirds, and anti-glare coatings can be useful for watching hummingbirds in bright sunlight when their colors are most obvious. Field Guide: A field guide with several hummingbird species profiles is helpful for distinguishing between some of the nearly identical species, particularly when observing female hummingbirds. Field guides dedicated solely to hummingbirds will have the most detail on these birds, which is best for the trickiest species. Feeding Station: Birders who are fortunate enough to have hummingbirds visit their yard can set up a dedicated feeding station to lure birds into a good viewing position. The right flowers and nectar will also entice hummingbirds to stay still long enough for proper identification. Providing perches for hummingbirds may get these birds to pose even longer for viewing or photography. 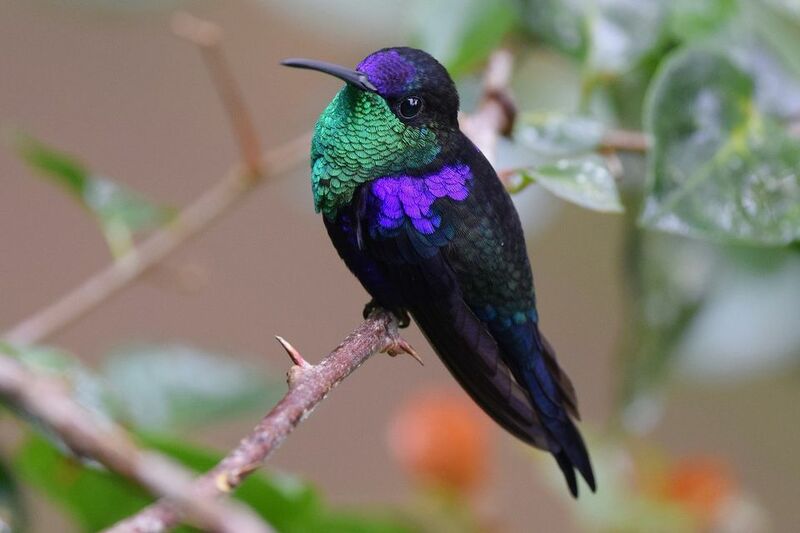 Flowered Clothing: While the clothes a birder wears will not automatically help identify hummingbirds, bright colors and floral prints may spark these birds' curiosity and encourage them to come closer for better views. Choose a shirt or hat with red or pink patterns to catch hummingbirds' attention. There are three basic ways to identify birds, including hummingbirds: by appearance, by behavior, and by territory. For some hummingbird species, the appearance of the bird can be the best way to identify it. Black-chinned hummingbirds, for example, are the only common hummingbird in North America with a distinct purple band on the throat, while calliope hummingbirds are the only birds to have a pinkish striped throat. For many other hummingbird species, however, birders will need to observe more than just the bird’s appearance to make a positive identification. All hummingbirds feed from flowers and nectar feeders, and they all have a swift, level flight. There are other quirks to their behavior, however, that can provide clues to their identity. Do the birds prefer to hover or perch while feeding? How aggressive are the birds to other hummingbirds or other bird species? How does the bird’s head or tail move while it drinks? Do the hummingbirds make noise while flying or hovering? Answering these questions about bird behavior can help identify hummingbirds. Rufous hummingbirds, for example, are exceedingly fierce and aggressive, and will harass other songbirds and actively fight other hummingbirds if they feel their territory is threatened. Many hummingbird species look and act similarly, and in some cases the geography of the bird sighting can be the best clue for its identity. Birders who understand the territory and habitats of different hummingbirds can often make accurate identifications even if the bird’s appearance or behavior may be uncertain. For example, the ruby-throated, Anna’s, and broad-tailed hummingbirds all have reddish throats, but they all live in very different regions of the country. The ruby-throated hummingbird is the only hummingbird regularly found in the east, and it is lacking entirely from mountainous and western regions. The Anna’s hummingbird is found along the Pacific Coast and in southern Arizona, while the broad-tailed hummingbird is widespread in the Southwest and the Rocky Mountain region. It is important to note that while many hummingbird species are geographically separated from one another, their migratory routes will often bring them into areas where they are not seen regularly. Birders who are aware of the geography of the birds’ migration paths will be better prepared to accurately identify hummingbirds at any time of year. Identifying hummingbirds can be tricky, but the more clues you note, from the bird's appearance and behavior to its range and habitat, the easier it will be to feel confident about which hummingbird you've seen.